A few weeks ago I was asked if I would like to Quilt-Along with Jana Machado making Thimble Blossom's new Night Sky Pattern. Now, if you have been around here for any time at all, you know I simply can not resist making star blocks!!!! I whipped up some of the basic Sawtooth Stars from the pattern in fun scrappy style. So cute!!! And lest you think those adorable Stars end up as orphan blocks, never fear :) I purposely made them to go along with me Bees Knees quilt that I am working on for my Grandparents. It is coming along nicely. Just a few more blocks to come and I will be ready to put this one together. So fun!! So how do you feel about sewing Stars?? Love em or Leave em or Somewhere in Between???? I love, love, love stars. You sure have made some pretty ones. That is such a cute quilt! I can't wait to see the finished product! 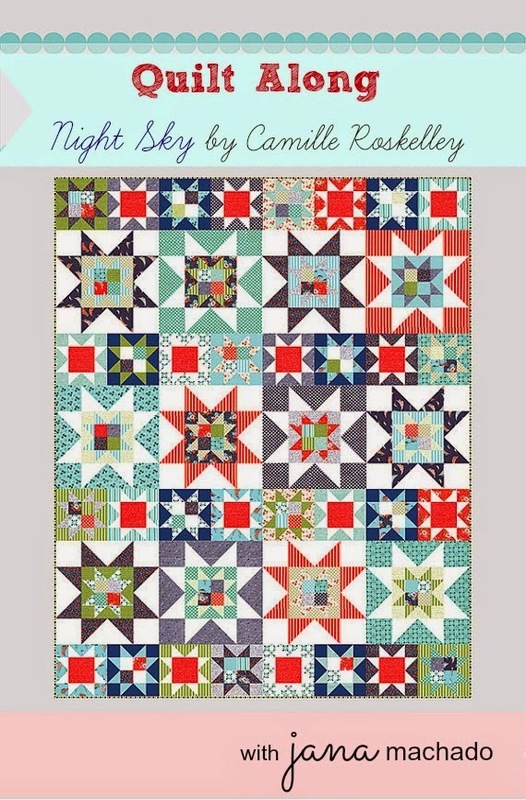 Night skies looks like a great quilt! I love the Bee Knees quilt you added the stars to Melissa! It's a really great sampler block quilt and such a cute name! Stars are the most awesome and versatile blocks out there! I love them. Love them, and yours are great!! Those blocks are so darned cute. Your grandparents are going to love it! Love the quilts, the stars and the fabric choices (S'Mores Love is so cute!). I love star quilts of all kinds. Your bees knees quilt is going to be so cute! I love making Star blocks and have a whole section in a binder dedicated to my 'Star' collection. Love your quilt with all the different cute blocks. What a special gift you are putting together for your grandparents! Love, love love stars! I am making a blue and white quilt with over 40 different star blocks. Your Bees Knees quilt is going to be amazing!! !